In October this year, the tiny village of Tawayel in the West Bank became national news in Belgium. On 29 September, the Israeli Military destroyed a power network which provides the small shepherding community in Tawayel (Tell al Khashaba) with electricity. The network was funded by the Belgian government and implemented by the Belgian Technical Company (BTC). The deliberate Israeli military demolition of 70 electric pylons and 4.5 kilometres of cables caught on camera by the EAPPI team from Yanoun sparked outrage in Brussels. 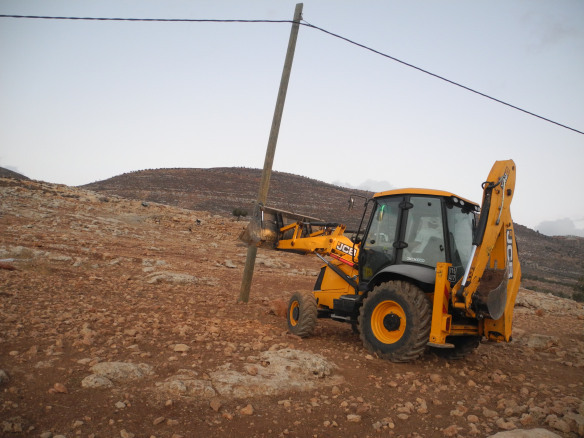 Israeli authorities demolish an electric pylon in Tawayel which was funded by the Belgian government, 29 September 2014. Photo EAPPI/H. Kjøllesdal. The destruction of the Belgian electricity network in Tawayel itself is not unique. Last week, the EAPPI team based in Yanoun arrived in Tawayel to witness the Israeli military in the process of destroying several water pipes funded by the European Commission’s Humanitarian Aid and Civil Protection department (ECHO). However, the strong condemnation of the demolitions expressed by the Belgian government is a positive step forward, as many demolitions go unchallenged by European funders. An EA, Ghassan, our driver/interpreter and a villager from Tawayel walk away from a water pipe damaged by the Israeli military on 2 November 2014. Photo EAPPI/A. Tesche. 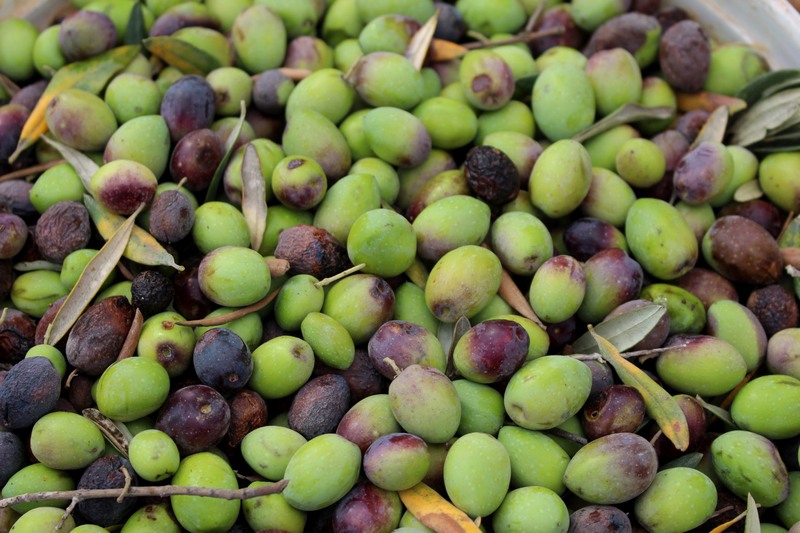 The European Union (EU) is amongst the largest donors in the Palestinian water and agricultural sectors. The EU and its member states help to fund water and sanitation infrastructure, electricity networks and roads in the West Bank, particularly in Area C. From 2002 to 2012, the Israeli military destroyed 82 projects with a total financial loss of €49.15 million. Since 2012, many more projects have been damaged by the Israeli military. Despite the financial cost to the European Union and its member states, few funders have objected to the demolitions or demanded compensation. In addition to the financial losses, every demolition has a human cost for the Palestinians living in affected areas. Tawayel is a shepherding community, dependent on electricity to store their milk, cheese and yoghurt products. Although the electrical network has been partially restored, the damage to the electricity pylons could have a negative impact on the livelihood of shepherds such as Osama Beni Fadil, who has nine children to support. Living with the reality of demolition can be extremely demoralising. “Nobody cares about us here, because we are not in Jerusalem,” Osama told EAPPI on 2 November after the demolitions of the water pipes, roads and one of his buildings. 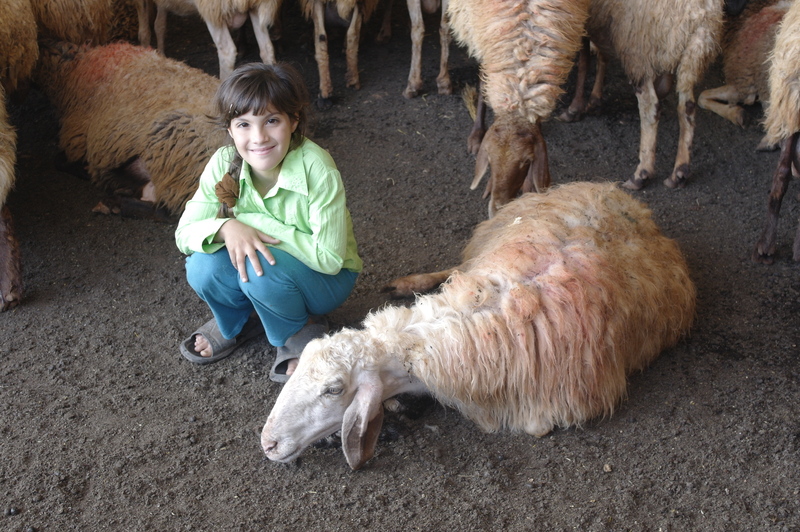 The daughter of shepherd Osama Beni Fadil sitting with the family flock. Villagers in Tawayel are dependent on livestock produce for their income, which requires electricity for refrigeration. Photo EAPPI/ A. Tesche. International Humanitarian Law applies to the whole of the West Bank, including villages such as Tawayel which are in Area C. Article 53 of the Fourth Geneva Convention states that destruction of personal property belonging to ‘public authorities, or to social or cooperative organizations’ is prohibited unless ‘absolutely necessary by military operations’. The destruction of water projects violates the human right to access clean and adequate water which is enshrined in multiple international laws. The demolition of water pipes and roads in Tawayel are also illegal under Israeli law, as according to locals they had not been issued with demolition orders. 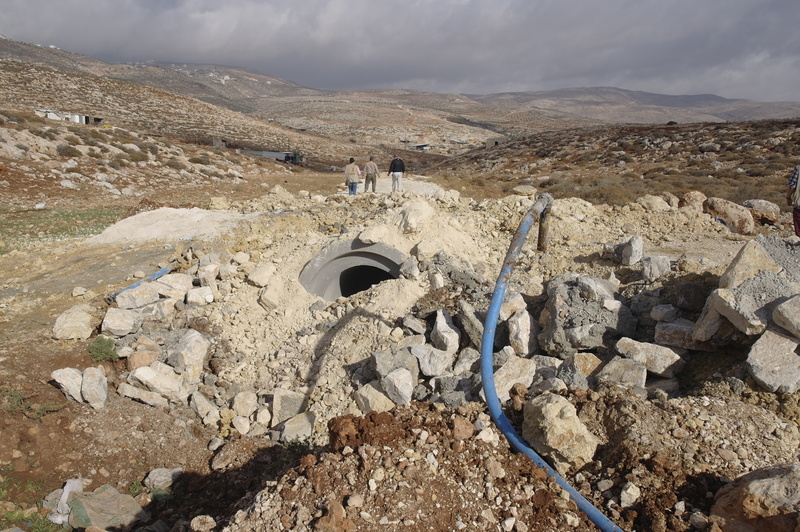 Israeli Military illegally demolish European Commission funded water pipes in Tawayel, West Bank. Video EAPPI/R. Viney-Wood. The destruction of the electrical network in Tawayel is not the first demolition of a European funded structure in the West Bank, and it is unlikely to be the last. In the case of Belgium, the electricity network is the first project they have funded to be demolished in the West Bank. 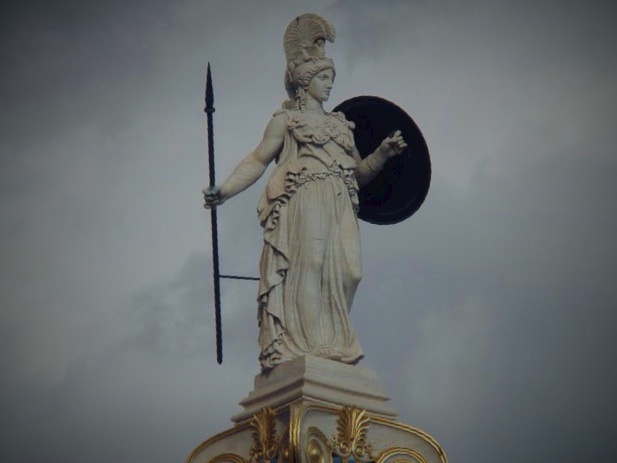 Although the project had an outstanding demolition order on it from 2008 which was re-issued in March this year, the Belgian government had made the ‘utmost diplomatic efforts’ to prevent the destruction. The disregard of these efforts by the Israeli military combined with public pressure following images of the destruction in Belgian media led the government to condemn the destruction. Reynders added that Belgium intends to discuss the matter of compensation with other European states at the EU level. Since the Belgian condemnation of the demolitions the Israeli military have not touched the electric pylons in Tawayel, which have been partially restored. It is imperative that European funders object to Israeli military demolitions of their projects, on legal and financial grounds. It is also important for European funders to condemn the human costs of demolitions which affect every day life in villages such as Tawayel. *Read more about the multiple demolitions Tawayel has faced in the past year. After decades of persecution, the Palestinian Bedouins now face a threat of forcible transfer to urban townships. Six township plans laid by the Israeli Authorities have provoked severe opposition from the Bedouins – some of them victims of displacement since the establishment of the state of Israel in 1948. Selim was born in 1907 in Saba, in the Negev desert, what is now the south of Israel. He lived his childhood under the Ottoman rule of Palestine, his youth under the British Mandate. As a young man he saw the rise of zionism and waves of persecuted Jews fleeing to Palestine. In his prime he became a refugee himself when the state of Israel was established. 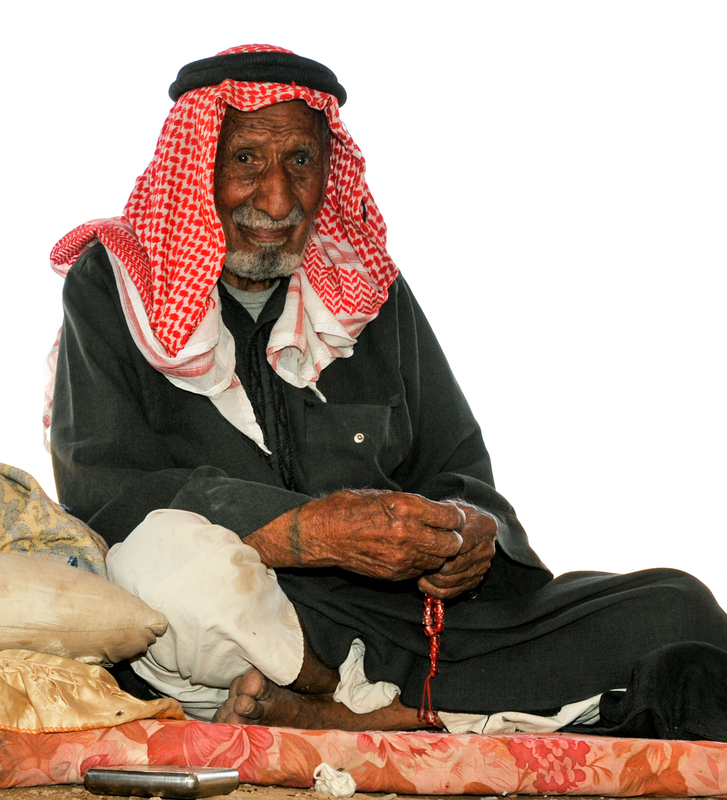 During the 1948 war he, like many other Palestinian Bedouins, was forced to leave his land in the Negev. He escaped to the West Bank, then under Jordanian rule. In 1967 Israel occupied the West Bank and Selim became a subject to Israeli military rule. During his 66 years in the West Bank he has witnessed several wars, uprisings, peace treaties, processes and negotiations. Now he lives with the family of his oldest son, Mohammed, in a shack made of tin, iron poles and tarpaulin, in the desert near Jerusalem. The family of 14 gets their living from herding their flock of sheep and goats. To the wider public the hilly desert plains they and their relatives live in are known as E1, named after one of Israel’s most ambitious plans of settlement expansion. Approved by the Israeli authorities in 1999, but halted due the international pressure, the E1 plan would link the settlement of Ma’ale Adumim to Jerusalem and create a wider settlement block by connecting it with settlements of Mishor Adumim and Kfar Adumim through a series of roads and housing initiatives. A map of the plots planned for houses where bedouin will be forcibly relocated. Photo EAPPI/BG. Saltnes. Bedouin from Khan al Ahmar who will be displaced by Nuweimah plans. Photo EAPPI/BG. Saltnes. 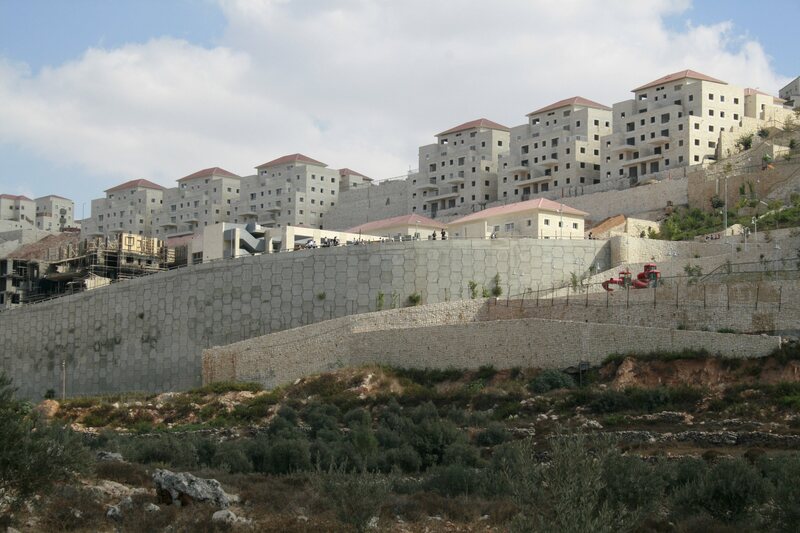 Today, Ma’ale Adumim houses over 36,000 Israeli settlers. Its Israeli approved municipal boundaries cover 48,000 dunams (48 km2 or 18.53 square miles), all of which are within the internationally recognized 1967 borders of the occupied Palestinian territory. The E1 master plan would allow for Israeli development on 12,000 dunams (12 km2 or 4.63 square miles). The international pressure may have halted the E1 plan but clearing off the Palestinian population from the E1 area continues. This year 39 homes and livelihood structures were destroyed in demolitions carried out by the Israeli authorities. Selim’s family has had their homes demolished four times during the past two years. The latest demolition took place last month. “When the soldiers came to destroy our home Selim tried to fight them,” his daughter in law, Salma, says. “Where are we supposed to go?” he yelled at them. Now the patriarch looks more docile, relaxing on a mattress with a lit cigarette in one hand while casually caressing some of his grandchildren, who all huddle around him, with the other. The Israeli authorities have come up with an answer to Selim’s question. In August this year, six municipal plans for as many as 7000 Bedouins to be relocated to planned townships were published. Largest of them is Nuwei’ma, a Palestinian village located just outside Jericho and surrounded by settlements and Israeli military bases. According to the plan three Palestinian Bedouin tribes: Ka’abne, Rasheideh and Jahaleen, Selim’s tribe, will be moved to Nuwei’ma. Most Bedouins are against the plan. Selim’s son Mohammed is one of them. “Who will give us money and take care of our livelihoods when we lose the income we produce from our sheep?” he asks. According to Nuwei’ma plan, the area given for each family would be 500 m2. “Here we have a lot of space to herd our cattle. There herding will be impossible,” he says. “Israel must let us stay here or let us go back to Negev, back to where we are from,” Mohammed says. The township plan also goes against Bedouin cultural customs. The realization of the township plans would mean putting and end to the traditional Bedouin culture in the Palestinian territories. If implemented, the six plans plans will lead to a situation of individual and mass forcible transfers. They are prohibited by the 4th Geneva Convention, regardless of the motive. A violation of this nature may be considered a grave breach of Article 49, giving rise to individual criminal liability and codified as a war crime. *More photos & stats on the Nuweimah plans. 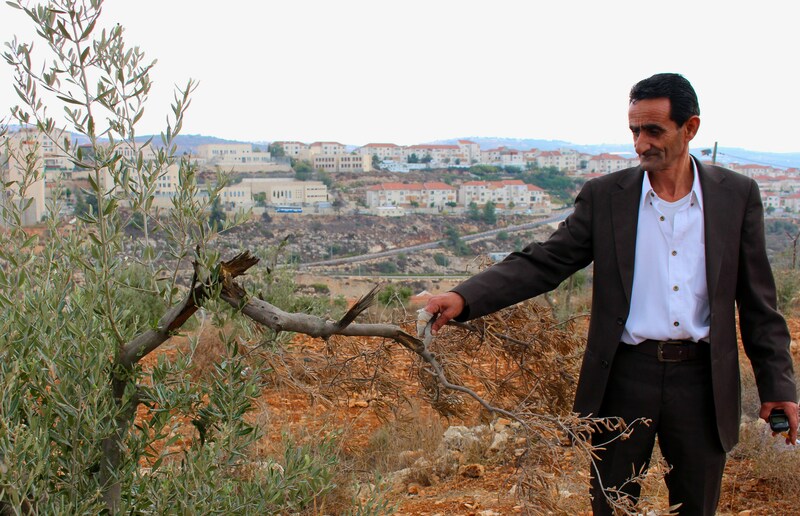 “Why is it a military zone for Palestinians only?” exclaims Ayman Banifadl, Mayor of Aqraba. He is referring to the ‘closed military zones’ or ‘firing zones’ which the Israeli authorities have assigned to 30% of Area C in the West Bank. These areas are meant to be used for military training exercises and usually have signs prohibiting all access, even though often signs are placed directly in front of already existing Palestinian communities. However, the Yanoun team has recently sighted Israeli settlers alongside the Israeli army during a military training exercise within a ‘firing zone’, indicating the ongoing collaboration occurring between the Israeli army and settlers. This incident also highlights the double standards which are exercised by the Israeli army in relation to who is allowed within these closed military areas. 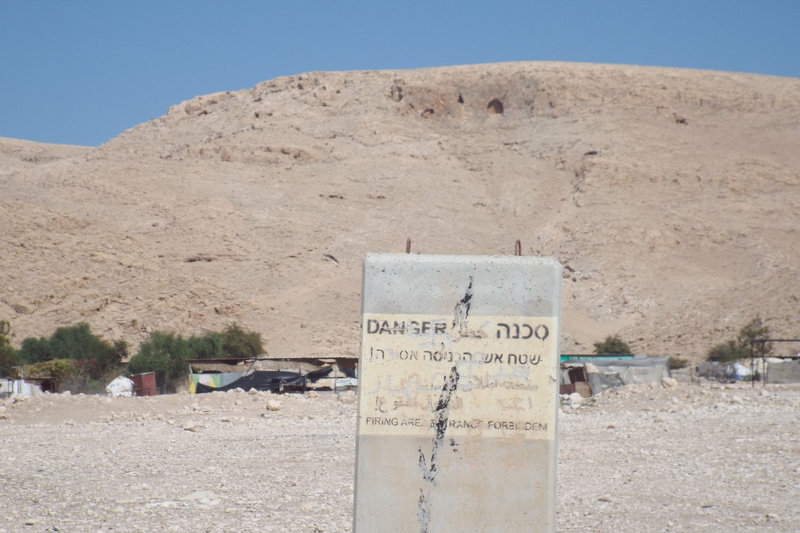 A typical sign placed in front of a community declaring an area a ‘firing zone’ in the Jordan Valley Photo EAPPI/N. Ray. Communities living in areas of the West Bank now considered a ‘firing zone’ by the Israeli authorities face huge threats to their existence. These threats include demolition, displacement, and limited ability to realize their rights to water, adequate shelter, education, health, and livelihood. Many communities have demolition orders on their structures and frequently Israeli authorities demolish houses & structures. Nearby to the large village of Aqraba is Tawayel (or, Tell al Khashaba), a small Palestinian herding community located within Area C and within a ‘firing zone’. The very existence of Tawayel has been threatened by the demolition of multiple houses and structures, including the community’s mosque on 29 April 2014. According to Ayman, “in 1976 the Israelis said that all the land from Aqraba [eastwards] to Jordan is a firing zone.” This announcement came despite multiple Palestinian communities living within this area. The reason for declaring the area a ‘firing zone’ seems clear to Ayman: establishment of Israeli settlements. He describes how the settlement of Gittit, to the east of Tawayel, was established. The area was first declared a ‘closed military zone’ and a small army camp was established. A mere 2 years later the camp was disbanded and the land was handed to Israeli settlers who built the Gittit settlement. “It is clear that these lands are used for economic reasons, not military ones,” Ayman tells us. 10 Israeli settlement outposts have been established and allowed to expand within these ‘firing zones’ in Area C, even though they are illegal under international and Israeli law. Whilst Palestinian communities present before the areas were designated ‘firing zones’, face frequent demolitions and are prevented from building to expand or repair their communities. Article 49 of the Fourth Geneva Convention states that the “Occupying Power may undertake total or partial evacuation of a given area if the security of the population or imperative military reasons so demand”. The Israeli army uses the area around Tawayel for military exercises on average once a month. As Ayman stresses, however, “there has been no war in this area since 1967.” The existence of these communities cannot be constituted as an ‘imperative military reason’. In the case of Tawayel, there are no plans for forced transfer of the community. Instead, the people of Tawayel are being slowly pushed off their land under the auspices of a ‘firing zone’ without anywhere else to go. Ayman believes that the Israeli authority’s policy is to ensure that all remote Palestinian communities are displaced to towns. If it was not already evident that a ‘firing zone’ only applies to Palestinians and not Israeli settlers, it became clear on 10 September 2014. The EAPPI team in Yanoun was called to Tawayel at 12:30 pm due to sightings of Israeli soldiers near to the village. When we arrived we found a group of 10 soldiers fully armed sitting under a tree sheltering from the midday sun, 100 meters from houses in Tawayel. We stayed in Tawayel to monitor the soldiers’ movements. At 1:30 pm, 3 Israeli army jeeps were sighted at the eastern end of the valley driving towards Tawayel. They had come to drop off more soldiers underneath the trees ready for, what it appeared to be, a training operation on foot. A shepherd boy from Tawayel looks towards a group of Israeli soldiers shading under a tree, 10 September 2014. Photo EAPPI/N. Ray. Israeli soldiers resting under a tree by Tawayel, 10 September 2014. Photo EAPPI/N. Ray. One of 3 Israeli army jeeps drives towards Tawayel, 10 September 2014. Photo EAPPI/N. Ray. A civilian jeep belonging to an Israeli settler drives past 2 Israeli military jeeps during a training exercise, 10 September 2014. Photo EAPPI/N. Ray. Following close behind the 3 military jeeps was a civilian jeep. Basem Dili, the Head of Tawayel, identified the driver of the civilian jeep as a settler by the name of Koby. He explains that Koby lives in the settlement of Itamar, near to Yanoun. According to Basem, Koby was the settler who had been in charge of confiscating land around Yanoun to build settlement outposts to expand Itamar. Koby paused to have a conversation with the 2 military jeeps which were stopped by the trees before he continued along the valley. Afterwards the military jeeps returned in the direction they had come from. What was occurring before our eyes was confirmation of the close, collaborative relationship existing between the Israeli army and Israeli settlers. 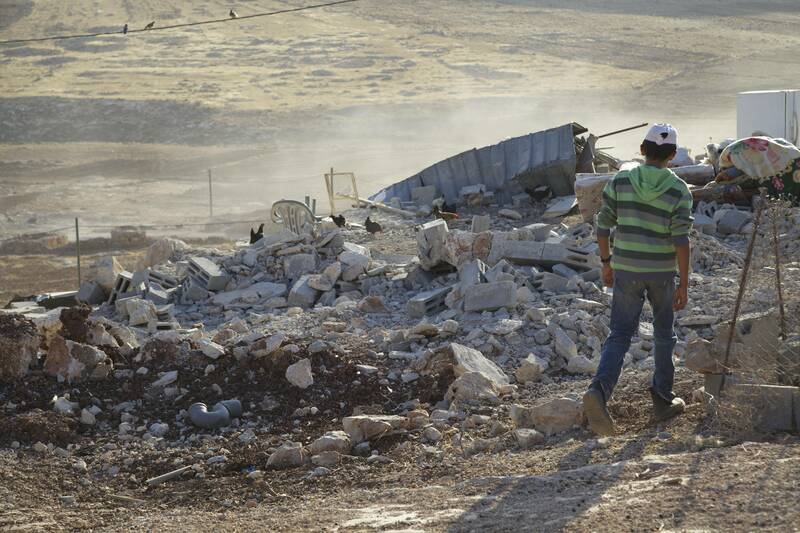 “No one is making a demolition order for the settlers; [instead] they are building a road for him,” said the Mayor of Aqraba at the most recent house demolition in Tawayel on 20 August 2014, which left 17 people homeless. ‘Firing zones’ in this area are being utilized for settlement expansion towards the Jordan Valley. Like the village of Yanoun, the disappearance of Tawayel would bring the expansion of illegal settlements across the breadth of the West Bank one step closer. It would enable the connection of Itamar to the Jordan Valley settlements. But the people of Tawayel continue to stay strong and remain on their land amidst military training exercises and house demolitions. They have no other choice but to stay, where else would they graze their livestock and earn a living? *On the morning this article was published, 29 September 2014, Israeli authorities arrived in Tawayel and demolished all the community’s electricity poles.